Oxford, 1st July 2015. Vehicle accidents are 90% due to human error, says Peter Wells of Volvo Truck’s Accident Research Team. Which is why vehicle manufacturers and the UK’s insurance industry are so interested in any technology which can cut accident statistics and their costs. 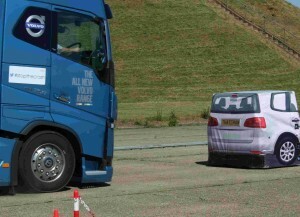 The latest of these vehicle technologies is Autonomous Braking (also called Autonomous Emergency Braking or AEB), a system that uses vehicle-mounted radar and cameras to detect an obstruction ahead, then slams on the brakes if the driver doesn’t react in time .. click to read further ..